Menu: Wheat Berry Salad, wine, and I believe there was a Ho-Ho cupcake involved somewhere in the night! Alright, so here is the beginning of this story. I have discussed our AMAZING supermarkets in Denver, yes? Well, for those lucky enough to live in Sunflower Market districts, you have experienced the excellent selection met with even greater prices. N-E-WAYS, they have a great bulk section, and I mean pretty great. I get most of the grains, nuts, and granola that we eat from here. Naturally, I peruse this section and scout out unknown stuff. Wheat berries has unfortunately been one of those things. I finally found a simple and great sounding recipe to debut this grain into our diet. The end of the story is yum, yum, yum…yum, yum, yum. Really. They are a tiny bit starchy, with a little bite, but with a hint of sweetness…in other words full of flavor for a whole grain. Definitely two thumbs up from us! 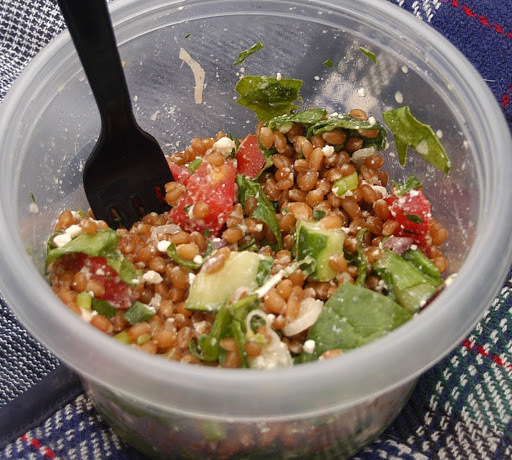 Place wheat berries in a medium sauce pan, cover with water (with at least 2 inches above berries). Cover and let stand for 8 hours, drain. 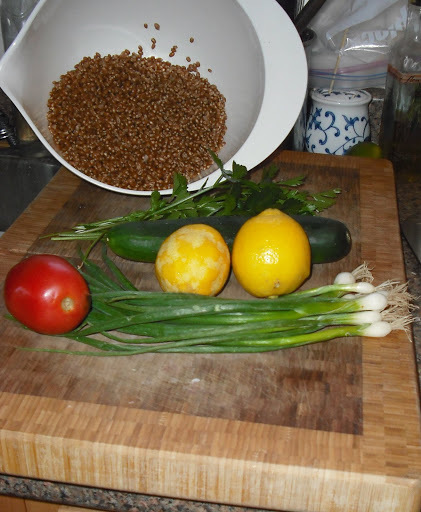 Place wheat berries in same saucepan and cover with fresh water. Bring to a boil, reduce, heat, and cook, uncovered for 1 hour or until tender. Drain and rinse with cold water. 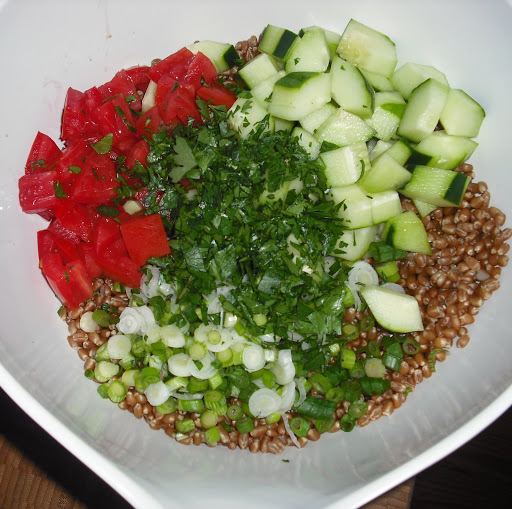 Place wheat berries in a large bowl and combine with cucumbers, green onions, arugula, parsley, and tomatoes. Separately, combine lemon rind, juice, S & P, and sugar in a small bowl. Gradually whisk in EVOO. Drizzle dressing over the salad, and toss well to coat. Top with cheese and let stand at least 20 minutes before eating to let the flavors combine. This entry was posted in salad, Vegetarian by callywoodfarms. Bookmark the permalink. That sounds soooo wonderful. Boy do I miss Sunflower Market. I'll have to scope out Trader Joe's for some wheat berries.